We’ve had a long time love affair with the work of Twin Lens. They are the masters of wedding photography from a photojournalistic approach, and today they’re here to share just what makes them tick. Read on for our special Q&A with Kitty and Craig, and you can find more of their fabulous work in the full gallery right here. Just make sure to really take the time to devour each image on it’s own as they just might take your breath away. SMP: Tell us a bit about yourselves and how you got your start in wedding photography. TL: Craig and I both come to wedding photography via newspaper photojournalism. We met while working in the newsroom at the Santa Fe New Mexican. Our resulting wedding photography has everything to do with telling the story of the wedding day through photographs. We’ve been married for 13 years now and have an amazing little girl named Maya. We created Twin Lens 8 years ago, knowing that the newspaper Craig was working for would be closing. We decided that instead of chasing the next journalism job, we’d take a leap of faith and try to do what we love while working for ourselves. SMP: Can you tell us a bit about your process with each couple before the big day? Specifically this lovely couple! TL: We have been INCREDIBLY fortunate that our approach and imagery have attracted a particular type of couple. People who book our services are folks who are very comfortable and confident in who they are and who want an honest, beautiful and truly unique record of their wedding day. Lopa and Vijay definitely fell into this category. They wanted us to tell the story of their wedding weekend not only by documenting the very involved traditions of their Hindu ceremonies, but also by capturing the moments between them, their families and friends without posing or orchestrating. SMP: Your photos tell beautiful stories and evoke such emotion. What is your approach to achieving this while standing out from other photographers? TL: This is where our journalism backgrounds come into play. We never know exactly what the picture is going to be until it unfolds in front of us, so we’ve learned to anticipate the moment and to compose on the fly. We try very hard to be unobtrusive and to wait for the decisive moment, light or composition to come together. We love that our couples accept us as part of the event, that we are able to be in the midst of everything, documenting without interfering with the flow of what’s happening. Our hope is that our images show what is truly real and unique about a couple and their wedding day. We don’t try to fit each wedding into a “formula”. We like to roll along with the day and see what’s visual and storytelling. We look for the big moments and small details and weave them together into a one-of-a-kind photo essay which narrates the day. SMP: What type of equipment do you use that give your photos such a distinct look? TL: We fell in love with photography during the days of film and darkrooms, and so that’s become a huge part of our approach at Twin Lens. We combine the latest digital technology with the old school principles and look of film. The combination of these two sensibilities is what creates our look. We find that the digital cameras are best for capturing fleeting moments, while the twin lens reflex cameras allow us to slow down and be more artistic in certain situations. We also bring along a couple of Holga cameras to each wedding. The Holga is a specialty film camera which creates images with an ethereal, old-time feel. The Holga has a plastic lens which creates a beautiful vignette around the edge of the image… very nostalgic feeling. The Holga “look” is the visual predecessor to what is now Instagram… think square and artsy. (except we can make giant, gorgeous prints for the wall from our negatives!) These are often our favorite images from a wedding day and seem to reinforce that sense of memory that you want wedding images to embody. SMP: What is your favorite shot from this wedding and why? TL: There are so many shots that I love from this wedding, and each one plays its own role in telling the story. The photo that makes me laugh every time I look at it is the black-and-white frame of Vijay while he’s getting ready for the wedding ceremony. He had a room full of relatives attempting to help him get dressed, each one offering a different opinion as to how he should wear each item of clothing. He had no experience with any of this, and was baffled himself. 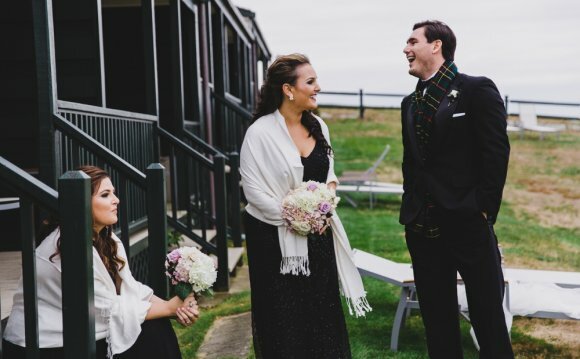 At one point, he just became overwhelmed by all the input, and this photo is a window into that fun, crazy pre-ceremony hour. I also really love the image of Lopa & Vijay on the beach. They had just changed out of their traditional outfits, into their swanky reception clothes. The sun was going down and they were taking a moment together before heading to the reception to see their friends. Just a sweet, quiet portrait of the two of them being young and beautiful and in love. From Kitty and Craig of Twin Lens… We want to take a moment to give credit to the ridiculously talented wedding planner for this event, Kimberly Richmond, of Runaway Bride Destination Weddings. While the venue and colorful Hindu rituals were visual in and of themselves, Kimberly built on all of it, and designed one of the most flawless and visual events we’ve ever had the pleasure of photographing.